Time travel has many enticing possibilities, but one of the most enjoyable would be to travel back to 1982 and tell John Carpenter that his new movie would someday score sixth place in a list of the 100 best horror movies – even beating his own iconic ‘Halloween’. 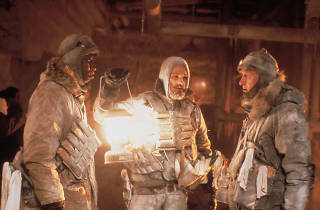 Like many future horror classics, ‘The Thing’ was hated on first release, dismissed as an ‘Alien’ clone more interested in pushing the boundaries of SFX than in character or tension. It was a disastrous flop, and threatened Carpenter’s once unassailable reputation as the king of the new horror. 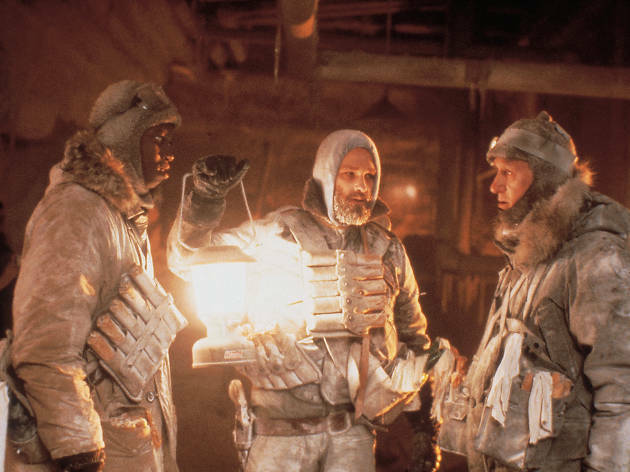 It’s hard to imagine now: with the benefit of hindsight (and, more importantly, repeat viewings), ‘The Thing’ has emerged as one of our most potent modern terrors, combining the icy-cold chill of suspicion and uncertainty with those magnificently imaginative, pre-CG effects blowouts. John Carpenter, Matthijs van Heijningen Jr. It says a lot about how seriously one should take movie critics (that is, not seriously at all) that I came here following a link supposedly to Time Out's negative review of Carpenter's 82 version, only to find it's transformed (Thing-like?) to a negative review of the 2011 version! One that, amusingly, contrasts it unfavourably with the same '82 version that Time Out's critic Geoff Andrews originally slated! The original (I don't count the ponderous-and-not-that-scary Hawks version, sorry) is a classic (one that, like punk a few years before, exposed how out-of-touch a generation of professional critics had become), and this prequel/remake (requel?) does as well as could be expected of it in filling in the events alluded to in that. It does everything 'well enough' but I'm not sure it was really needed. What it does do notably well is dove-tail seemlessly with the '82 version (both in terms of story details and in film style) - it deserves credit for its attention to detail in that regard. Entertaining enough for me.Carpenter's version was brilliant in it's day cause there was nothing else like it at the time.I thought this held up quite well though maybe lacked suspense compared the original. I can't help thinking the reviews have all been a little harsh. While this film did have a lot of similarities to Carpenter's film, I thought it also tied in quite nicely and works well as a prequel. Of course you could argue that what happened to the Norwegian camp is best left to the audience's imagination but for those who want to pick at the scab, this film is for you. I agree that this film is a little too hack-and-slash though. Perhaps it would have benefited from a few more tension building scenes (as with Carpenter's film). Another small criticism is that the characters are paper thin and forgettable when compared to Carpenter's film (and even those characters were hardly well drawn). On the plus side, I thought the film was disgusting enough and shot in a similar enough style to sit beside the 80s one without it being completely obvious that there has been 25 years between the two films. Find a DVD of the 1982 movie and enjoy - forget this plodding dog. It's not a film that sheds extra insight merely some shots of a spaceship - it's hard to imagine a voracious Thing building anything. Efficient pre-make, probably enjoyed more if you haven`t seen the original, but begs the question: aren`t there any new ideas out there? Yes Dull cgi the orignal looks better even 20 years on cgi, looks too obvious and unbelievable the way the creature moves. It show how heavily movie makers today rely so much of cgi that is distinctly fake. As for the movie itself complete rubbish, no character development or personality, no tension, just boo scares. The main character is so drab and has no personality to speak of, really didn't care about anyone in the film, poor poor directing from start to finish. @martinezz. You sure you're talking about the same film we are? The Thing made in 1982? "Dull CGI"? Most of it was fantastic! Read TJ's review as it is good for one thing alone, "dull"ing your all ready "dull" expectations (as were mine) then delightfully finding that this is NO disgrace after all! "dull" is a word everyone would attach to THE DEEP BLUE SEA if they were honest...not this. 7/10 but if it were the first, then more. I'd have to agree that the reviewer totally missed the boat. To say that the paranoia is lacking when the opening scene creates it so beautifully (no one here speaks Norwegian?) and the end encapsulates it perfectly is perplexing. The reviewer also seems to skip any evidence for commentary. heck, the movie scores on the paranoia with Morricone's simple heartbeat bass line. And "Superstitious" playing as the camera pans through the empty areas of the bass, until eventually setting on the dog as it walks into a room, and the shadow turns . . . Simply masterful. There are a few examples; the gauntlet's been tossed to the reviewer and the "this is just empty fanboy crap" folks. Justify, please. The premise of this film is quite suspenseful, but the execution seems to rely on natural squeamishness rather than generating genuine fear. By this standard an actual autopsy would count as horror. Apparantly this reviewer didnt watch the movie, as it is one of the most eery horrors to hit the screens as well as an intelligent storyline. Reviewer Either didnt watch the same movie or wasnt intelligent to understand the delicate tension set up by Carpenter. This is a masterpiece plain and simple. It captures a real feeling of fear and paranoia with nobody able to trust anybody. Like the characters the viewer is never sure who is the alien and who isn't. The reviewer for Time Out clearly how has no appreciation for suspense and the sci fi/horror genre. Idiot. The Time Out critic got it right. This is a ridiculously overrated piece of tripe drooled over by immature and illiterate fanboys who confuse gore and shock effects with genuine scares, and think elaborate FX are all a film needs. Despite the liberties the 1951 version takes, it is still one of the best and most intelligent SF thrillers ever made. Everybody gives this film 5 stars for a reason! If you want fantastic suspense and a sense of utter paranoia as well as superb special effect then this is the sci-fi / monster flick for you. It has a real sense of terror, a definite feeling of 'oh my God, where is it now, who's going to be next!' This film WILL give you the willies if you watch it on your own for sure. This movie is a classic. Only a moron would say it is a rip off of alien. Apart from the fact that has an alien they have nothing in common. This movie is not a "mindlessly macho monster mash" it has strong theme of paranoia, nobody knows who to trust and thats what makes the movie so great, not to mention possibly the greatest ending in a movie ever which people to this day still talk about. You either saw a different movie or you are retarded.